Rieker bring us 62427-80 FAWMULE. Created on the incredibly popular 'FAWN' last, these ladies wedge heeled mules are a summer essential. The silver strap over the toes features rhinestone detailing while a floral patterned strap bridges the arch of the foot with a metallic ring intersecting the two. A velcro fastening has been added for ease of use and a secure fit. Riekers ANTISTRESS technology offers sublime comfort. The shock absorbent and flexible sole unit works in conjunction with the cushioned insole. 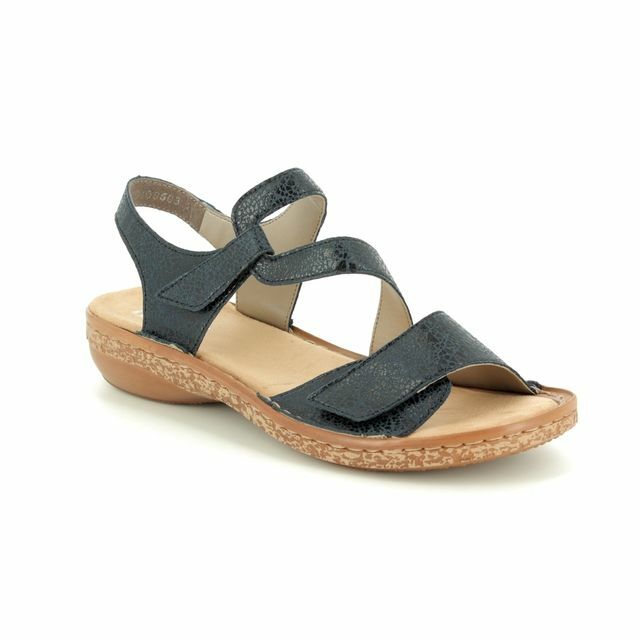 Rieker have used a mid height wedge heel on these ladies sandals for elevation while remaining comfortable. Buy your Rieker ladies wedge heeled mules from Begg Shoes, an official Rieker stockist.